We have another tasty recipe for you as part of our British Food Fortnight coverage. 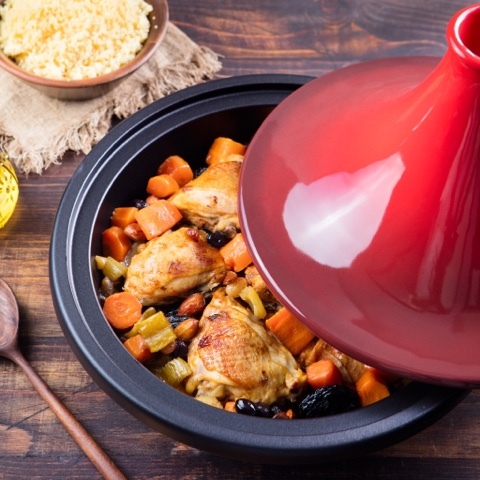 This Slow Cooker Chicken Tagine recipe is brought to you by Del Monte and it looks delicious! I know, I know - chicken tagine doesn’t sound very British! But British cuisine has always been a melting pot of different flavours from all over the world and tagines have become very popular here. This particular tagine is cooked in a slow cooker, so it's simple to make with very little preparation time. Del Monte peach slices have been a British favourite for decades and they are featured in this recipe. I love Del Monte tinned fruits and I've often used them to make tasty desserts, but I've never used them in a savoury recipe. So I think I going to have to give this recipe a go - if I can convince my Mum (who's also my carer) to help me make it that is!